Outdoor technology for your home! Outdoor technology makes perfect sense when living in a sub-tropical climate, as we do in Queensland, so it’s often a big part our projects. 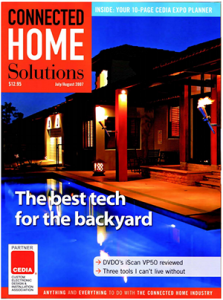 Connected Home solutions recently published a great article on the ins-and-outs of technology for the backyard. It features (among others) one of 5thCorner’s favourite projects – the Bali House in Sanctuary Cove. Here’s a digital version of the article; in case you missed it in print.